December 2017 marked the first time ever that the stock market had positive returns every single month of a year. I’m thankful for the impact the market has had on our net worth this year. Nevertheless, let this serve as a reminder that the high returns and low volatility we’ve been experiencing are unusual and shouldn’t be expected to persist. What will 2018 returns look like? Your guess is as good as mine, but so far we’re off to a positive start. Our net worth increased in every area this month, ending the year at $743,422, up $12k from last month and up $137k from this time last year. Despite buying several last minute Christmas gifts and traveling for the holidays, our cash balance went up by more then $1k. For our trip, we drove and didn’t need to get a hotel so it was a pretty inexpensive trip. We’re still focused on increasing cash but don’t expect it to be where we want until February. That’s when I’ll be getting my annual bonus which we’ll use to boost our cash and make a really big mortgage payment. Our Christmas gifts for the kids were actually quite simple. We make a concerted effort to keep our kids expectations low, so even though they only got a couple gifts each, they were thrilled. They got some LEGO sets I got on sale, a new DVD player for the car, and some other things that were thoughtful and unique to their interests. Things like clothes we always just buy when they need them regardless of Christmas or birthday timing so gifts from us are usually things in the ‘want’ bucket. Side note - we have always tried to make sure our kids know we will never lie to them. This means we don’t do things like Elf on the Shelf, Tooth Fairy, Easter Bunny, or even Santa Claus. Despite our best efforts, they got pretty heavy doses of Santa at school and it has really been confusing to the kids of who to believe. Doh! The S&P 500 returned 0.98% in December, which explains most of our returns. We also continued to add to our investments from normal payroll deductions. All of my retirement contributions are going in as Roth contributions so at least I know that portion is 100% ours. I had a small holding in some crypto-currencies, but when some of them tripled in under a week in December, I cashed some out. I still have a small position, but have taken out more than my initial investments and am only playing with the house money. It’s been fun to watch, but it definitely looks and feels like a bubble. My personal rule of thumb is that I don’t invest more than 1% of our investable assets in speculative trades. This would include things like options, individual stocks, and most certainly Bitcoin/crypto-currencies. I know I could be missing out on a huge opportunity here, but it’s not worth risking a painful loss to play with more than 1%. We continue to build home equity, and made an extra principal payment yet again. Starting in January, we’ll be increasing the amount we pay even further. We reduced our mortgage balance by over $22k in 2017 and are planning on even greater reductions in 2018. 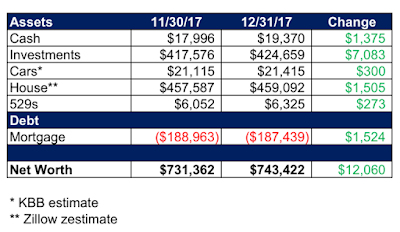 I have been trying to get a good estimate on the impact of the new tax bill on our household and it looks like we could see as much as $4-5k in lower taxes next year. If and when we start to see the increase in our take-home pay, it will likely all go straight towards the mortgage. Most of our home improvement projects are on hold until spring, when we plan to replace the grass in our front yard. We’ve tried several different things to get the grass to look good but have decided we finally need to bite the bullet and start from scratch with new sod. There are a few big home projects we’d like to take on, but as of now are thinking they may be 2019 projects. The big ones would be to remodel our kitchen and master bathroom. Neither are terrible as-is and both would be extensive and expensive even doing most of the work ourselves. For 2018, we’re also keeping our eyes out for some good deals on a few specific furniture items and hoping that none of our A/C or furnace units die. There isn’t much to report on our vehicles other than that I really love driving my new car. I knew that upgrading from a Corolla to a Lexus would be an improvement, but I wasn’t expecting the change to be so drastic. I’m not sure if that means my old car was that bad, if the new car is that great, or some combination. I can’t explain why KBB has our car values going up this month, but the total value still is reasonable and not a large percentage of our assets. We are now including our 529s in our net worth, but there really isn’t much to talk about here. We’re adding $200/mo and allocating it 100% to stock mutual funds. Our current savings rate is not enough to fully fund all our kids’ college, but we aren’t planning on covering all of their expenses anyways. I’ve toyed with the idea of stopping these contributions and paying down the mortgage even faster, but this really wouldn’t make that big of a change in our timeline. We’ll have more than 7 mortgage-free years before our first child starts college and that should be plenty of time to further pile up our savings. Thanks for checking in. I’m looking forward to what 2018 brings.